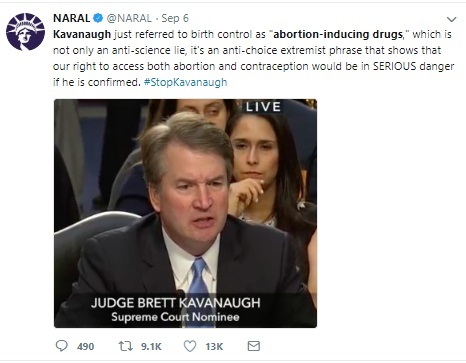 Abortion enthusiasts continue to use old scare tactics (and outright lies) that are designed to drive one result: peel off support for Trump’s Supreme Court nominee, Brett Kavanaugh. 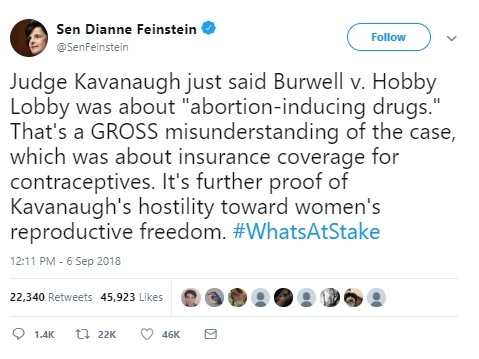 Their narrative is simple: if a Constitutional originalist gets on the Supreme Court, then hundreds of thousands of women will die from illegal abortions (a lie thoroughly debunked here) and the court will make contraceptives illegal. This narrative is, of course, false. 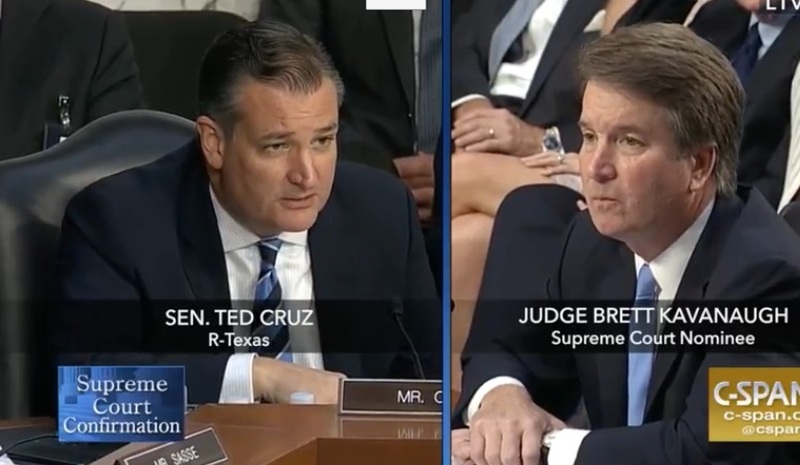 Sen. Cruz: Another case you were involved in as a Judge is that you wrote a dissent from denial in rehearing… Priests for Life case. Can you tell this committee about that case and your opinion there? Judge Kavanaugh: That was a group that was being forced to provide certain kinds of health coverage over their religious objection to their employees. And, under the Religious Freedom Restoration Act, the question was first, was this a substantial burden on the religious exercise. And, it seemed to me, quite clearly it was. It was a technical matter of filling out a form. In that case, they said filing of the form would make them complicit in the provision of the abortion inducing drugs that they were, as a religious matter, objecting to. 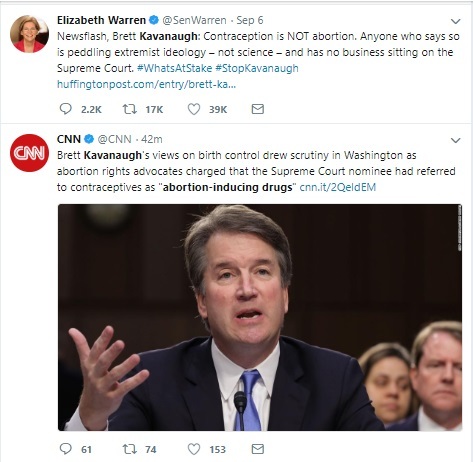 And right on cue, the Huffington Post deceptively titled an article, “Brett Kavanaugh Refers to Birth Control as ‘Abortion-Inducing drugs’ at Confirmation Hearing.” Again… context is everything. This is complete spin. 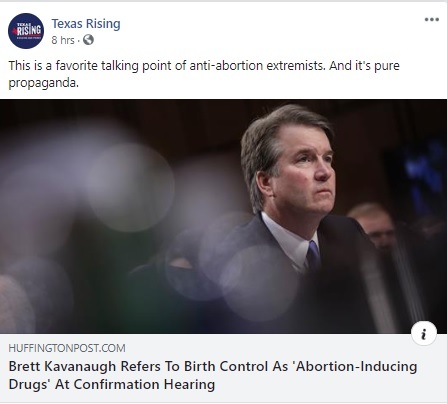 This so-called “news” article was then quickly shared by pro-abortion surrogates like Texas Rising, which “trains emerging grassroots leaders and activists on university and college campuses” to “leverage that power during an election cycle” and support pro-abortion candidates. 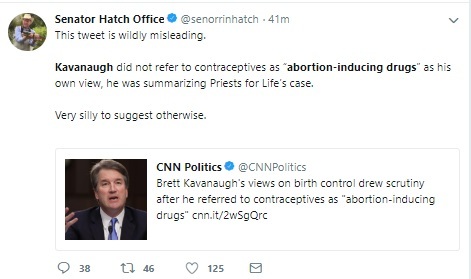 In context, it’s not totally clear whether Kavanaugh is endorsing Priests for Life’s claim that birth control causes abortion, or merely repeating it. Ultimately, though, his larger argument is quite clear: To him, the contraceptive mandate was an unacceptable infringement on the religious freedom of Priests for Life (even though Obama’s mandate allowed them to seek an exemption on grounds of religious freedom). This argument shows that if confirmed, Kavanaugh would be likely to rule in ways that would restrict contraceptive access in America. Except… there’s no proof of this. At all. The Priests for Life case was about religious freedom, not contraceptive access. The fact is that Judge Kavanaugh was stating (rightly) that the litigant in the case, Priests for Life, had argued that being forced to offer “abortion inducing” contraceptives to employees under the Affordable Care Act was a violation of their Constitutionally protected religious freedom. These statements aren’t “anti-science.” They’re from the emergency contraception’s own manufacturers. But the abortion industry likes to pretend otherwise. Abortion has long been based on the lie that the preborn child in the womb is not a human person, despite evidence to the contrary. By using scare tactics, lies, and deceptive headlines, those working to keep a radical abortion agenda on the Court are showing clear signs of desperation. What is crystal clear is that public support for abortion has become so fragile that its enthusiasts see the Supreme Court as their last hope, and that is why they are willing to say just about anything.